A year ago we talked candidly about the issues our company faced and how we intended to address them. Our number one priority was to add spectrum, the airwaves that carry our customers' mobile communications. We also said we would accelerate our company's shift to growth businesses. And I made it clear that we would take steps to further improve our capital structure and return value to our shareowners. We signed nearly 50 transactions last year to add new, high-quality mobile capacity — including WCS spectrum that previously was not available for mobile broadband. This increased our average nationwide spectrum holdings by a third, which gives us a good runway to deliver further innovation and growth. With this newly acquired spectrum as a foundation, we launched our company's most comprehensive organic growth plan in several decades. Called Project Velocity IP — VIP, this plan will let us reach millions more customers with advanced technology and new services. We increased our total wireless subscriber base to 107 million and continued to lead all major U.S. wireless providers in smartphone penetration and average revenues per wireless contract subscriber. 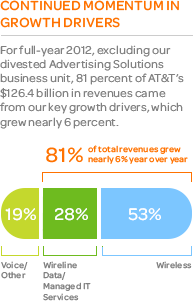 Our mobile data revenues grew 17.8 percent to a $27 billion annualized run rate. We posted the largest annual increase in total AT&T U-verse TV and broadband subscribers in our history, bringing our total to more than 8 million. Our U-verse revenues grew 37.9 percent to end the year at a $10 billion annualized run rate. 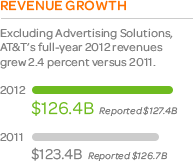 Our most advanced business services, which now make up $6.5 billion in annualized revenues, also grew at a double-digit clip. Overall revenues grew to more than $127 billion, the highest total in our company's history, and adjusted earnings per share increased 8.5 percent. Cash from operating activities topped $39 billion, up 12.8 percent from the previous year and our best total ever. We invested $20.4 billion in capital expenditures and spectrum purchases to expand and upgrade our network capabilities for customers in the United States and around the globe. We more than doubled the U.S. population covered by our 4G LTE network — the industry's most advanced, high speed wireless technology — and deployment continues to run ahead of schedule. We increased our quarterly dividend for the 29th consecutive year and paid out more than $10 billion in regular quarterly dividends — the most in our history. We also repurchased 6 percent of our total shares outstanding. Combining dividends and share buybacks, our company returned $23 billion to shareowners in 2012, the highest total in our history. We refinanced $12 billion of our debt, taking advantage of historically low interest rates. In addition, the investments in our pension fund posted solid returns, and we took an important step to solidify our commitment to our employees by seeking to contribute a preferred equity interest in AT&T Mobility, our best asset, to our pension trust. We expect to gain the approvals needed for this contribution in 2013. It's notable that all of this investment has come during a time of economic uncertainty. Many companies pulled back during this period. But we've maintained our financial strength and kept our focus on delivering for customers over the long haul, which has allowed us to invest aggressively through the cycle. 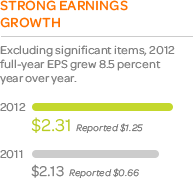 For several years now, AT&T has invested more capital into the U.S. economy than any other public company. The past few years also have been a time of dramatic technological change for our industry. Smartphone adoption in the United States has soared. Tablets and other mobile Internet devices are now on a similar trajectory. The global mobile apps ecosystem has exploded into a major industry, far beyond what anyone conceived just a few years ago. And because of these developments, how our customers live and work has forever changed. The United States has led the world in this revolution, and I'm proud to say that our company has been at the forefront — delivering the fast, mobile connectivity that's the foundation for all of this innovation. We've come very far, very fast. But we're still early. To date, the mobile Internet has been defined for most of us by what we can do on our devices — so much so that most of us think of the past few years as the smartphone era. But today and in the years ahead, the services we provide are poised to play an even more transformative role. We're now riding the next waves of innovation, moving into the mobile life era — where advanced communications connect virtually everything and where every aspect of our customers' personal and work lives are more intelligent and immediate, without regard to device or location. How our customers buy things, manage their health, secure their homes, access entertainment, how they learn and make decisions, how they travel and discover — all this and much more is quickly being reimagined. Our business customers, too, are finding new ways to speed growth and operate more productively with fully connected solutions. For example, there's tremendous potential to transform our healthcare ecosystem — and make everything from record keeping, billing and payment to diagnosis, monitoring and ongoing care faster and more efficient. In much the same way, mobile payments are transforming the way our customers conduct commerce — moving from plastic credit cards to secure, personalized wallets accessible on mobile devices. The foundation for all of this is smart, seamless high speed broadband connectivity — delivered by meshed wireless and wired networks. This is the heart of what our company provides. So, what's required to accelerate this new world? To build the pervasive, smart, high-capacity networks that our customers expect takes large-scale capital commitments. So, our entire industry and its surrounding ecosystem of suppliers and innovators need tax policies and regulatory approaches that create an attractive environment for investment. We plan to expand our 4G LTE high speed, wireless data network to cover 300 million people by the end of 2014, 50 million more than our original plan. To deliver an even better experience, we plan to make this network more dense through extensive use of innovative small cells in addition to traditional wireless towers. We plan to expand our U-verse customer reach by approximately a third and drive IP broadband connectivity deeper into our wireline network by year-end 2015, to reach more of our customers where they live and work. We plan to deploy high speed fiber connections to 1 million additional business customer locations by year-end 2015. Once Project VIP is fully implemented, nearly all of our customers will have access to high speed IP broadband, either wireless, wired or both. These investments will provide a much broader platform for a wide range of innovative services and solutions, a number of which are profiled in the following pages. Capital investment and great networks provide the foundation, but the next step is equally important — that's a mindset and a commitment to accelerate innovation and change. Everyone benefits — and customers are the ultimate winners — when innovation flourishes. That's why our company has taken the lead — reaching out to entrepreneurs, application developers and others outside our company and collaborating with them to bring innovation onto our network faster. Our goal is to foster a virtuous cycle of demand, growth and further innovation. Accelerating the pace of innovation also requires a willingness to obsolete old technologies so that we can give our customers the best and most advanced solutions. That's an important part of what we've committed to do with Project VIP. By 2020, we expect to have fully transitioned our customers from decades-old, legacy technologies to an all-Internet Protocol network architecture. This will require us to rethink every aspect of how we operate, but the long-term payoffs are significant in terms of better service, new capabilities for our customers and lower costs. An important key to future investment and innovation in our industry is regulation that doesn't lock our customers into old technologies. That's why we continue to work closely with policymakers as we transition beyond decades-old rules that were designed for point-to-point communications through copper wires and antiquated technology. To make possible a mobile-centric world of anywhere-to-everywhere connectivity, it's critical that regulations obsolete themselves as old technologies fall away. Customers and the entire industry benefit from regulatory models that don't struggle to play catch-up with new technologies, but actively pave the way for them. It's a great privilege to be part of a company whose services touch and benefit so many lives. In keeping with this role, we've also committed our company to philanthropic leadership in areas that will make a difference in the communities we serve. Our employees volunteer their time and make generous contributions to thousands of community projects, and their heroic efforts in the face of natural disasters such as Superstorm Sandy this past year bring to life the very best of our company's heritage. Of special note, our employees have played a major role in our signature philanthropic initiative — AT&T Aspire. Launched in 2008, this project initially committed more than $100 million to support programs that help high school students succeed in school and prepare for careers. In 2012, we committed an additional $250 million to Aspire over the next five years — to bring new resources to help students who are at risk of dropping out of high school. We've expanded the mentoring program, and we're driving technology innovations to reach and engage young students. I also ask you to join us in another important cause. Please help set a good example and remind your family and friends to never text while driving. Let's change behavior and save lives. Finally, let me emphasize that our achievements in these areas and across our business come from the great talent, dedication and hard work of AT&T's employees. On their behalf, thank you for your continued confidence and support. Jim Cicconi, Senior Executive Vice President-External and Legislative Affairs, AT&T Services, Inc.
John Donovan, Senior Executive Vice President-AT&T Technology and Network Operations. Left to Right: Standing Randall Stephenson, Chairman, Chief Executive Officer and President; John Stankey, Group President and Chief Strategy Officer; Ron Spears, Senior Executive Vice President-Executive Operations; Wayne Watts, Senior Executive Vice President and General Counsel; Cathy Coughlin, Senior Executive Vice President and Global Marketing Officer; Bill Blase Jr., Senior Executive Vice President-Human Resources. Seated John Stephens, Senior Executive Vice President and Chief Financial Officer; Ralph de la Vega, President and Chief Executive Officer, AT&T Mobility; Lori Lee, Executive Vice President-Home Solutions; Andy Geisse, Chief Executive Officer-AT&T Business Solutions; Jim Cicconi, Senior Executive Vice President-External and Legislative Affairs, AT&T Services, Inc.; John Donovan, Senior Executive Vice President-AT&T Technology and Network Operations.